No, you're not crazy. Interviewing yourself is a very effective way of gathering material for a life history. WHY WOULD I WANT TO INTERVIEW MYSELF? Convenience. You can choose when and where and how to record yourself; you don’t have to rely on someone else’s schedule or availability. You can work at your own pace and address only the issues that are important to you. Familiarity with the subject. After all, who is more acquainted with you, than you? And who understands what you want to accomplish with your personal history better than you? HOW DO I GO ABOUT INTERVIEWING MYSELF? Digital voice recorder. These are dedicated recording devices that are available in a range of prices. DVRs generally give a higher quality recording when an external microphone is attached. This may be preferable if the interview is to be preserved as a recording and not transcribed, because you want the highest audio quality possible for archival purposes. Smart phone or tablet with recording app. Convenient, inexpensive, and can work quite well in the right environment. Make sure you practice with it before you begin your stories. Here I am at the Riverton Family Search Center, recording a few stories on video. Speech-to-text software. Programs such as “Dragon Naturally Speaking” transcribe your speech automatically as you speak into a microphone attached to your computer or other device. The downside is that the software is not always perfect in interpreting what you are trying to say; again, you will have to proofread carefully or your "brilliant plan" could be immortalized as a "brain implant." A good interviewer is well-acquainted with his subject, having prepared before the interview with research and study. Preparation is just as important when you are interviewing yourself; it will keep you on task and keep you from rambling. Determine your purpose, audience, and scope. Purpose: Why are you telling your life story? What do you hope to accomplish? Write it down and refer to it often. Your purpose will help guide what you talk about in your interview. Audience: Who are you talking to? Who will hear or read what you have to say? Write a clear statement of who your personal history is intended for. It may help you to put a picture in view and pretend you are talking to that person or persons as if they were in the room. Scope: What are you going to talk about? How broad or how narrow is your subject matter? Narrow your focus and be as specific as possible. Sketch out a life timeline. 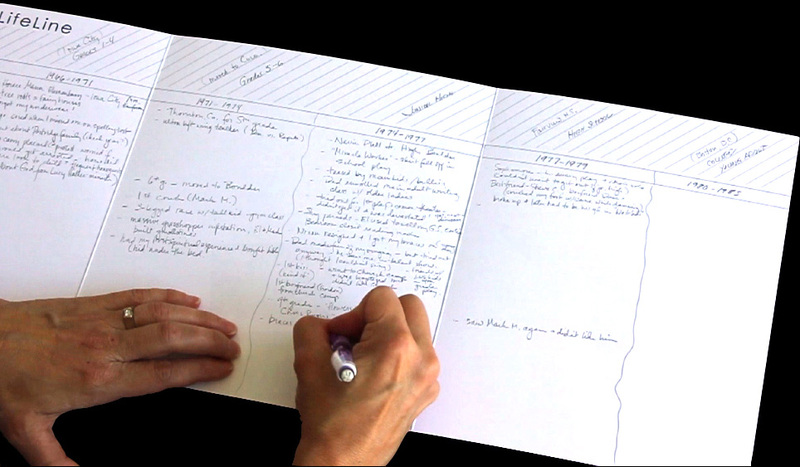 Take some time before the interview to brainstorm people, places, and events in your life and note them on a timeline. Just jot down anything that comes to mind for now; you’ll narrow focus later. Review memory trigger questions. The StoryCorps and Family Search websites, among others, have great lists of questions. Highlight those that you might want to talk about. Here is a sample of some memory trigger questions in our book, "How to Save Your Life, One Chapter at a Time." Review your pictures. Your pictures may help remind you of stories and bring a flood of memories. Go quickly through your pictures and select only those few that relate to your purpose, audience, and scope and make some notes. Select and prioritize your stories. List the most important ideas from your timeline, brainstorming, and memory trigger questions. What begs to be told? What would others be curious about? List your top 3 to 10 most important stories. Give a rough working name to each story and sketch a few notes you can refer to in interview. Get comfortable. Find somewhere private, quiet and with limited distractions. Eliminate background noise as much as possible (turn off loud refrigerators, fans, etc.). Bring some water, tissues, and a comfortable chair. (A parked car on a quiet street can make a good sound studio.) Then just begin, telling one story at a time. Distribute it in recorded form. Put the interview on a CD or digital file and give to your loved ones. Post it to the internet if you like. You may want to send a copy to your local genealogical library or the Library of Congress. Transcribe your recording. Distribute a printed copy as is, or edit to your heart’s content and use it as a narrative for a life story book with pictures. Here is a little book I created from the interview I did in the Family Search Center. Final words of advice: have fun with it! Don’t let the process overwhelm you. Even one small recorded personal experience is better than none!